BNI of the Heartland: BE PASSIONATE... BE REMARKABLE...BNI! 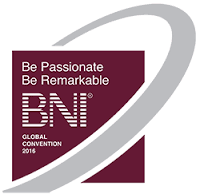 The theme of the 2016 Global Convention, for BNI Directors from across the world, was Be Passionate, Be Remarkable, BNI! The convention took place in Anaheim, CA November 9-10, and provided a look back at the last two years as well as a look of what is to come in 2017. While BNI's vision is "Changing the Way the World Does Business, it is important to remember we are thinking globally, and acting locally! Vision was one of the key words at this year's event. Many business people have a vision of where they want to take their business. We worked on personal visions, regional visions and even how to create a chapter vision. Part of a chapter's vision is reliant on your chapter's standards and the minimum you expect from each other. Do you have a vision? If the answer is no, it may be time to write the next chapter in your book, or your chapter's book. Most of BNI's existence over the last 32 years was because of members from the Baby Boomer Generation, but the numbers have shifted in recent years to include many more individuals from the Millennial Generation, and Gen X! So what are you doing to attract more of Millennials? Currently Millennials are the largest Generation in the U.S. and soon will be in the World. They are also the most educated generation in history. Since one of our Core Values is Life Long Learning, this Generation is a perfect fit for BNI. They do business by relationship, and they for people whose values are aligned with theirs. 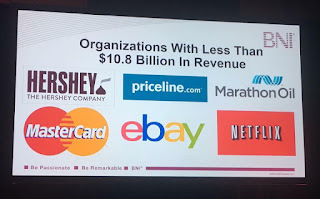 "It is not what you know or who you know, it is how well you know each other that counts," said Ivan Misner! The big difference is our customers (YOU) are making that! Finally, our Keynote was Isaac Lidsky, who is a speaker, author and entrepreneur. You may remember him as Weasel on Saved by the Bell: The New Class. He talked about Living and Leading with Eyes Wide Open. You might think vision again, but the irony is that Isaac began to lose his sight in 1993, at the age of 13. While at first the fear slowed him down, nothing would stop him. Today he is the CEO of a large construction firm in Central Florida. His overarching message was to refuse to be afraid and you won't be afraid. Focus on you and what you, only you, want to accomplish, then determine what your next best step is. Answering these are easy, but ignoring the everything else is the hard part. and tell the story of your experience!